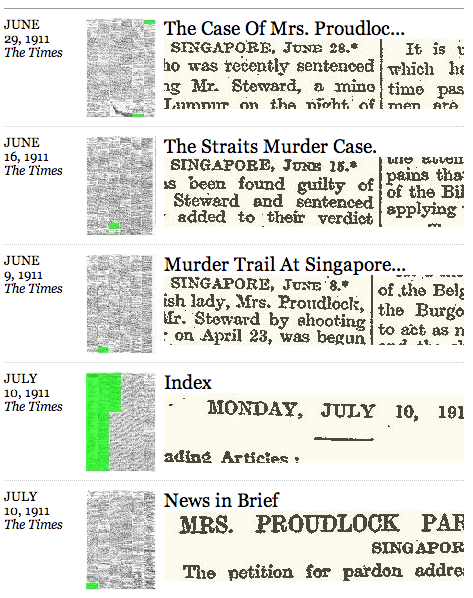 Following my playing with QueryPic and the Lincoln assasination I thought I’d have a quick experiment to see how the Proudlock murder case was reported. I’d originally thought about a ‘compare and contrast’ with Welsh Papers online but their corpus ends in 1910 and the murder trial took place in 1911, so that kind of died a death. and in fact there are slightly under 170 mentions, for example this report from the SMH. The tightness and height of the peak shows that clearly the trial was a major sensation. in other words, news was now spread as quickly to Australia as it was to England. Singapore of course lay on the major telegraph route between the UK and Australia, so this is hardly surprising but quite a nice little demonstration of the speed of the spread of the news in both directions …. This entry was posted in Uncategorized and tagged newspaper, proudlock, querypic, telegraph. Bookmark the permalink.